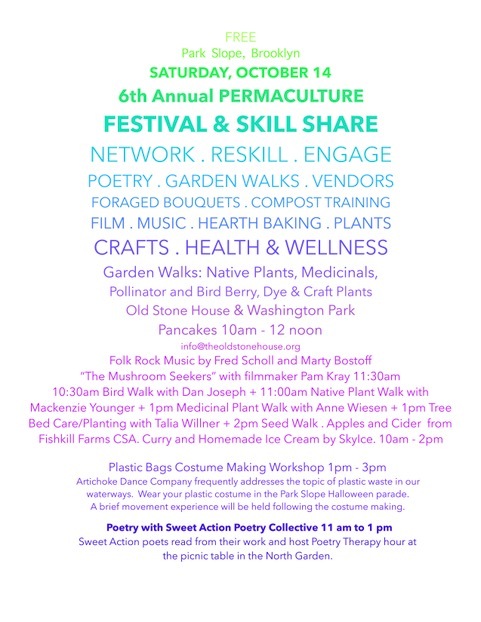 Sweet Action is participating in the 6th Annual Permaculture Festival and Skill Share on Saturday, October 14th. As part of a day long event at the Old Stone House in Park Slope, Sweet Action poets are reading from their work and hosting Poetry Therapy hour. Nurture your inner poet—share a poem, take a poem, get a writing prompt. We can be found at the picnic table in the North Garden from 11am-1pm.